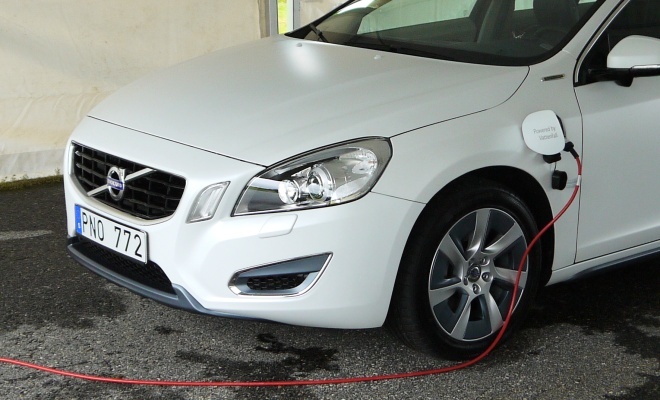 Volvo’s V60 Plug-in Hybrid Electric Vehicle will go on sale in the autumn of 2012, so there’s about a year of development work still to complete. Which is just as well because I appear to have broken the one I’ve borrowed. All I did to the unfortunate hand-built prototype was switch it off and on again too quickly, and the fiendish software lurking behind the dashboard got all confused. Now it won’t switch either off or on, despite increasingly insistent prods of the starter button. Fortunately a pair of Swedish technicians are on hand to pop the bonnet and, presumably, press the big red button marked In Case of English Idiot. The control computers reboot in mere moments and, once again, we have go capability. The V60 PHEV has complicated new software because it’s a complicated new car. Under the bonnet is a tweaked five-cylinder diesel engine, driving the front wheels through a conventional six-speed automatic gearbox. At the rear, there’s a 12kWh lithium-ion battery pack and an electric motor, feeding power to the rear wheels through a differential. Each axle can independently push the car along but since there’s no mechanical connection between the two, other than asphalt under the tyres, they have to cooperate to get along. When they pool their efforts, the car has quite astonishing get-up-and-go. Floor it and you can feel an unwavering electric shove from the back even as the auto box slurs between its six gears at the front. That five-pot, 2.4-litre engine fills the cabin with a tuneful bellow when its full 200 horsepower has been summoned. At the other extreme of its character, with the electric motor alone wafting you along, the V60 hybrid is as quiet as a cathedral. Rear-seat passengers may hear a hum under electric acceleration, and there’s some unobtrusive road and wind noise, but that’s it. You can select either full-bore or church-mouse mode via a row of buttons sited just ahead of the gearlever. Choose Pure for electric progress, for the 30 or so miles that the battery will last between plug-ins. Switch to Power mode for the above mentioned tyre-shredding shenanigans. Or choose the middle way and select Hybrid mode, where the engine and motor will step in and out of play to optimise efficiency. At low speeds Hybrid mode is mostly motor, at higher speeds mostly engine. And lastly there’s a “Save El” switch, which will let you store up battery power for later in your journey. If the battery reserves are low when you thumb the button, the car will top them up by generating enough power for about 12 miles of EV motoring. If the battery already has at least that much charge, it will preserve what’s there until Pure mode is selected or until Save mode is cancelled. In next year’s production model this option will have its own button, but for now I have to select it with a double prod of the Hybrid button. All very complicated but not nearly as complicated as the stuff under the bonnet and under the floor. The car boasts two starter motors belted to the engine – one for conventional cold starts and another for instant in-gear restarts. The second starter also doubles as a generator for topping up the batteries on demand, while the rear drive motor doubles as a generator in hybrid style, recapturing energy when the car is slowing or braking. Because the diesel engine is often not running, various normally parasitic ancillaries have been made electric, including the power steering, aircon compressor and transmission oil pump. Of course many owners will ignore absolutely all of the above, and simply leave the car in its default hybrid mode, concentrate on the foot pedals, and leave the car to sort itself out. To help encourage careful driving, there’s a noticeable step in the throttle travel, which you have to consciously push through to summon up full flood. There’s also a very neatly designed digital dashboard, with a calming blue colour scheme. There’s a central speedometer, digitally rendered in analogue style, with clever use of variable shading to supplement the virtual needle. Personally, I’d prefer some big digital numerals to a fake circular dial, but the graphics are excellent nonetheless. Within the orbit of the speedometer an image of the car is painted, displaying any relevant warnings such as open doors or unfastened seatbelts. To the left, there’s a simple bar showing the battery’s state of charge. Regeneration will see virtual bubbles rising up within the bar, the greater the level of regen the fizzier the image. To the right is a demand meter, which swings upwards as your throttle toe presses downwards. In Hybrid mode, a dividing line is used to indicate the point at which the engine will fire up, helping you to stay within the electric zone if that’s your goal. If you select Power mode, an additional gauge appears superimposed on this area, to remind you that you’re not being green anymore. Fussy bubbles aside, I like the dashboard – it’s an interesting and relatively clear way of communicating useful information to the driver with just a brief glance. My test drive is limited by the confines of a one-mile test track at Volvo’s Gothenburg headquarters. It’s an undulating loop of off-camber corners and crests with a short straight. A few laps are enough to establish that the steering is crisp and linear with little torque steer, and that the brakes are reassuringly firm with no detectable transition between regenerative and mechanical braking. There are also no unpleasant shifts in feel or braking effort as you slow to a stop. 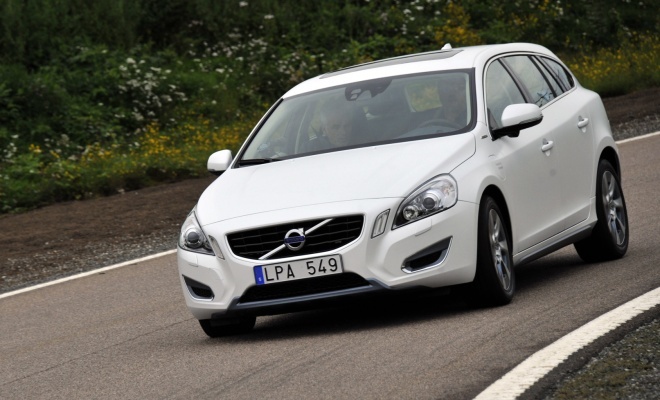 Hans Nilsson, product manager for the V60 PHEV admits that rear-biased regenerative braking is not exactly an ideal setup. “Strange things can happen when brake with only the rear wheels,” he concedes, but the car’s stability software appears to be on the case. I notice nothing unsettling as I lift off halfway round a fast corner, which is the kind of situation where rear braking is most likely to upset the car’s poise. Admittedly the road is dry and I’m nowhere near the limit, but clearly Volvo’s engineers will have less certain surfaces front of mind, given the heavy snow that fell on their Gothenburg base last winter. Weight is well disguised, with the battery pack and motor nudging the tally towards two tonnes (the precise total has not been announced). No doubt the extra rear weight actually helps the handling in what is normally a front-heavy car. 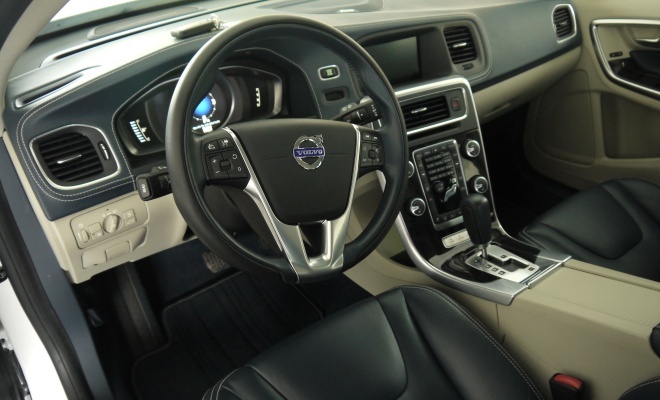 If things do go pear-shaped, there’s the reassurance of Volvo’s impeccable safety engineering. Indeed, the company has a set itself a tough goal for 2020: to build cars capable of causing zero injuries to passengers and pedestrians, through both active and passive safety systems. 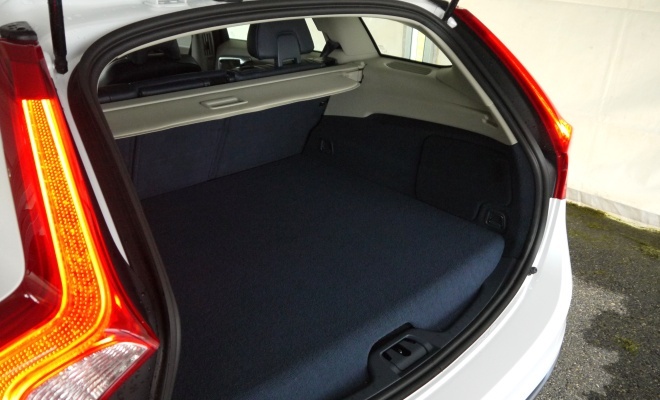 For this car, additional work has been done to protect the energy-dense battery when the car is whacked up the back. Volvo has released a very impressive crash-test video showing how the battery remains unscathed after a brutal 55mph rear impact (see below). The battery is a 200-cell, 400V lithium-ion unit, with a nominal 12kWh rating. Only 8kWh is actually used, in the interests of long life. The cells are water cooled and heated, exchanging energy with the aircon system whenever possible, for example when the cells are worked hard in cold weather. “The battery is like a little child, you have to take care of it,” Nilsson says. 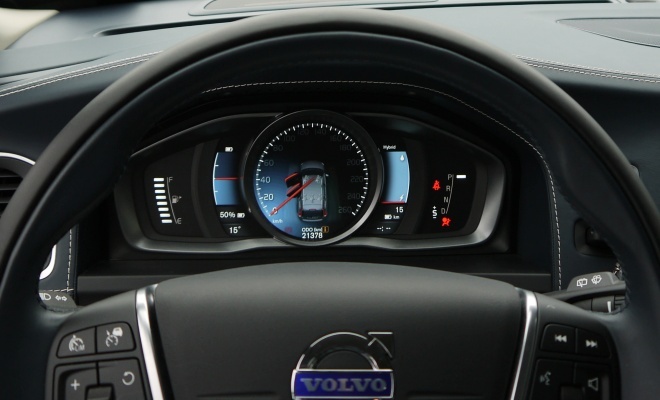 In common with most plug-in cars, the V60 can preheat or pre-cool its battery and interior while the car is still connected to the mains – there’s an iPhone app to control things remotely. The car does have its faults – boot space is compromised, it’s very heavy, and the electric-only range is relatively short – but it has bags of personality and is great fun to drive in all its three guises. The big sticking point will be price. All that technology and additional hardware won’t come cheap. Volvo has yet to announce costs, but I wouldn’t be surprised to see it top the company’s price list at somewhere around £45,000 – becoming the flagship or halo car for the whole Volvo range. Whatever the price proves to be, Volvo has clearly built a very impressive, capable and versatile vehicle in the V60 PHEV. 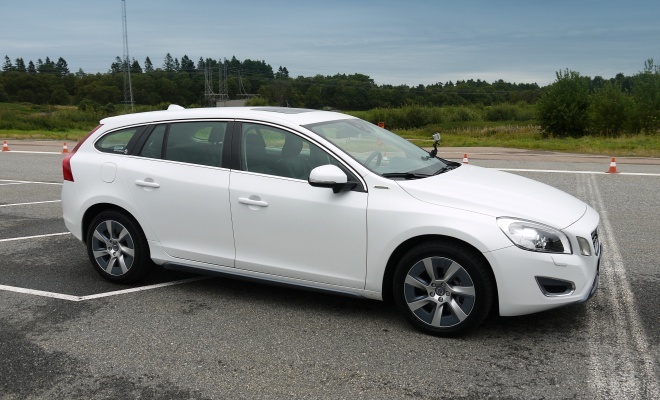 And finally, if you want to see a video of me driving the V60 PHEV, you can do so over on YouTube.